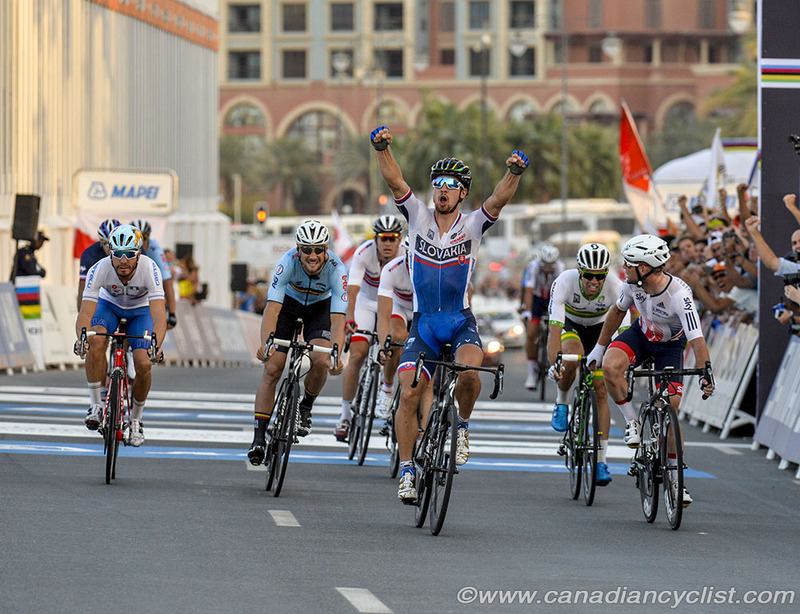 The Road World Championships in Doha, Qatar, concluded on Sunday with the marquee Elite Men's 257 kilometre road race. Ryan Roth finished a stellar 15th, among the best professional riders in the world. Defending champion Peter Sagan of Slovakia successfully held onto his title in a sprint finish. 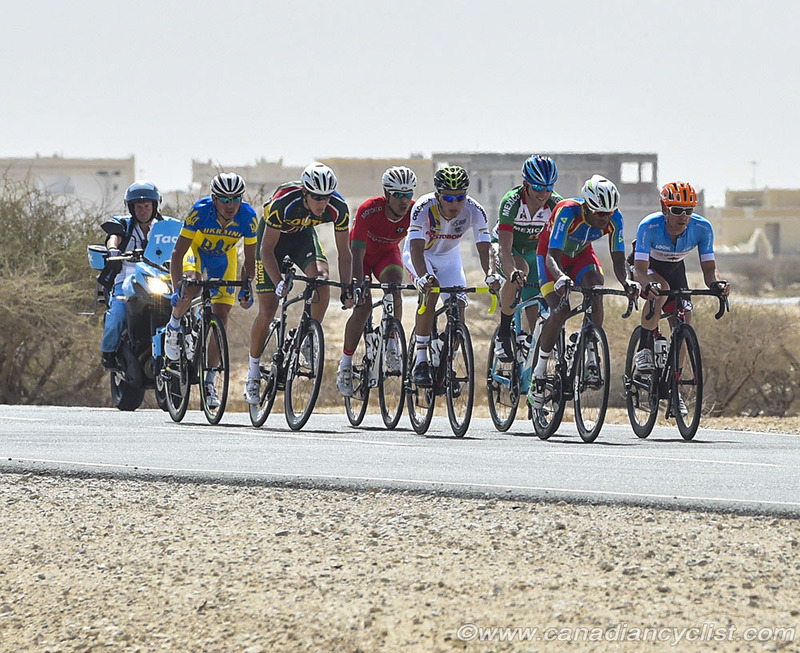 The Elite Men's race took the riders north of Doha on a long loop into the desert before turning south to finish with seven circuits of the final 15 kilometre course on The Pearl island. Strong winds and temperatures in the high 30s Celcius made for a grueling race of nearly six hours. Roth was a member of an early breakaway that went clear just four kilometres into the race. 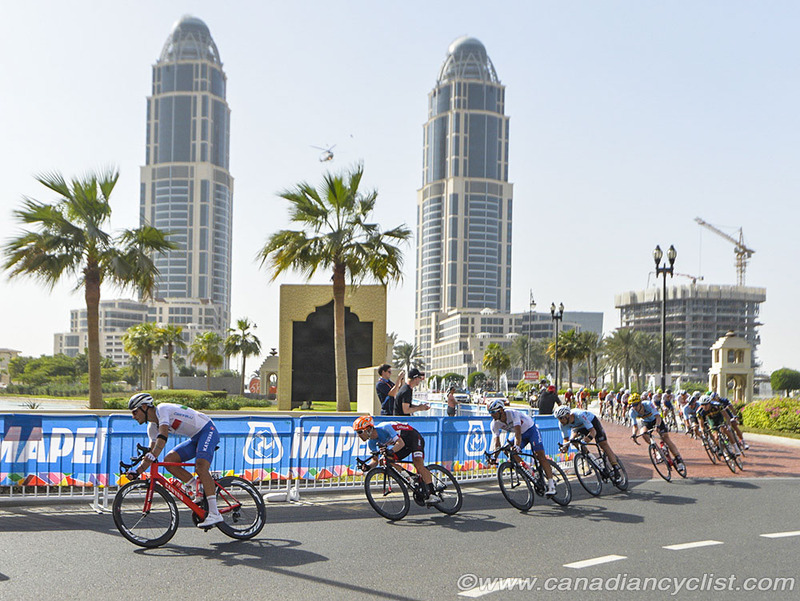 The group reached a maximum gap of nearly ten minutes, before being reeled in by a chase group shortly before The Pearl circuit. The Canadian time trial champion stayed with the leaders despite the high pace, and finished nine seconds behind the lead sprinters. This is the best Canadian finish in Elite Men since Michael Barry was seventh in 2003. The first leg of the race was north into a headwind, so the peloton stayed grouped up, allowing the break to open up such a large gap. However, the race then turned east (right) for a short segment, and this is when the fireworks happened. Belgium drilled it at the front as soon the race turned the corner into the crosswind, hitting speeds of over 75 kilometres per hour and blowing the field to pieces as everyone scrambled. Belgium, Norway, Italy and a few select others, including Sagan, Mark Cavendish (Great Britain), Niki Terpstra (Netherlands) and Michael Matthews (Australia), got on the train, but others missed it - notably Germany's Andre Griepel and Marcel Kittel, and France's Nacer Bouhanni. In the attack, Italy had Elia Viviani, Norway had Edvald Boasson Hagen and Alexander Kristoff, while Belgium had six, including Tom Boonen and Greg van Avermaet. the gap was up to 40 seconds by the time they turned south with a tailwind, and the chasers never got back. The break was caught with a little over 20 kilometres to go to the circuit. "My role for today was to try and get in the early breakaway," explained Roth. "It's a hard thing to do, but luckily the first move I covered was the break of the day. We had a good plan, with Adam [de Vos] to take care of [feeding] the guys from the car, with all the water and ice and everything that is needed to race in 40 degree heat." "Guillaume [Boivin, Montreal QC], Ryan [Anderson] and Antoine [Duchesne] were our guys for the circuit, and Hugo [Houle] was our captain on the road, because he has done the Tour of Qatar a lot, and has the WorldTour experience." "Once we got up the road, it was just about managing my effort as best as possible; keep the group rolling, stay hydrated and do everything necessary to survive a long day." We didn't have a lot of information, but we heard that there was a selection coming up fast, so we backed off and waited for them to catch us. From that point on I was focussed on almost breaking it into 10K pieces at a time - just get to the next 10K, then the next 10K..."
"Once we got to the circuit it was the same thing; just get to the next lap, and then the next one. For the finale, I actually wasn't feeling too bad, so I just wanted to do the best result I could. A gap opened up just in front of me in the last kilometre, so I wasn't able to be with the front guys sprinting, which was a bit disappointing." "I also have to say thanks to all the staff who worked so hard. Our prep camp in Israel played a huge part in the team being prepared for this kind of race, so I have to give a special thanks to [team supporter] Sylvan Adams who made it possible." Team manager Kevin Field said "I assigned break duty to Ryan because I trust 100% he can do it when asked . And it was a good chance for us to have a reliable guy up the road before the echelons started. For us, the race played out exactly like we expected, and it was super important having Ryan up there."